It's sad to say the summer is already more than half way over. But to compensate for the impending end to some summer lovin fun, the city of New York for the third year in a row offers one of its yearly contributions to make sure New Yorkers enjoy their streets literally to its fullest: Thus, Summer Streets August has arrived! This year the 2o10 route offered to all bikers, pedestrians, and skaters alike will connect the Brooklyn Bridge to Central Park with recommended connections. There will be two opted routes to take: there is a long passage or the shorter version with most of Park Avenue closed off to all other vehicles from 7am to 1pm every August Satuday--you pick. Along the way, there will be other exciting events offered, so if you are riding, don't forget to catch some interesting happenings as you pass them by. This tradition, is still very young--only having started in 2008. It has become one of the main attractions during NYC summers. Check out the videos, route maps and the activity list link below to ready yourself for this year's Summer Streets expeditions! 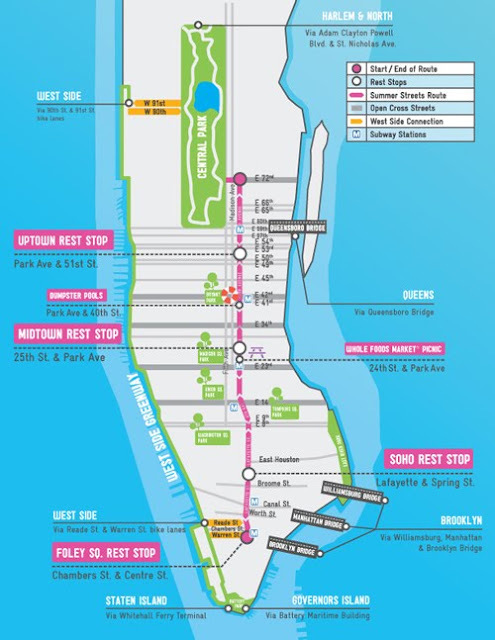 Go HERE to check out this year's Summer Streets Activity List.